WESTO has been supplying oil care systems and oil care services for hydraulic and lube oil systems for more than 25 years. 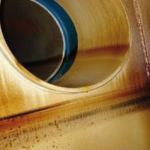 In recent years, more and more impurities have been found in oil systems – especially in those of turbines and compressors. These originate from ageing, that is, degradation products of the oils and that form resinous, gelatinous, varnish-like or sludge deposits. This can shorten the service life of bearings and gear units and also lead to faulty or poor control response due to sticking valves, which can impact plant availability and result in significant cost increases. In turn, this gives rise to problems that can be tackled during normal operation by means of systematic oil analysis and special oil treatment processes. Oxidation, that is, the absorption of atmospheric oxygen, is a process that takes place continually. To counter this, antioxidants are added to the oil during its production. These react more readily with oxygen than the base oil, protecting the oil in the process. These additives are themselves degraded during the actual chemical reaction. At the very latest after these additives have been degraded, oxidation recommences and with it degradation of the base oil. 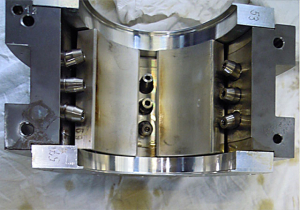 Thermal decomposition of the oil has a number of causes that are independent of the effects of atmospheric oxygen: for instance, hotspots at individual bearings due to tight bearing clearances. 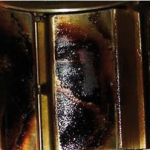 Static charging and discharging can lead to high-temperature arcing in the oil. An increased air content due to too short a storage period in relatively small tanks and/or poor air release properties lead to pump cavitation or microdieseling with likewise extreme, localised overheating. Contamination/impurities: in addition to basic wear, particulate impurities also lead to oil ageing through the agglomeration and consequently the binding of antioxidants based on polar forces. Water in traces in excess of 200 ppm likewise lead to ageing of the oil. Contaminations with incompatible residual lubricant following an oil change or with foreign bodies also affect the properties of the oil, causing it to age. The reaction products of oil ageing are insoluble in oil and resinous or gelatinous. In bearings or on gear teeth, they can form varnish-like films and harden under the influence of heat. This in turn leads to a localised temperature increase (hotspot) and a further acceleration in the ageing process. A different effect can be observed at relatively cold points in the oil system. The dissolving power of the oil is reduced, so that the degradation products transition from a dissolved to a suspended state, are increasingly precipitated and agglomerate due to their polarity. Superfine foreign particles are also absorbed. 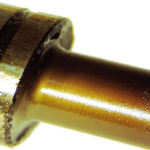 As the clearances in control valves measure just a few microns (µm), this can lead to edges at the valve pistons breaking off or to seizing, which in turn results in incorrect control response. Deposits on heat sink surfaces reduce their cooling capacity. Whereas the sludge in the tank can be removed relatively easily, coolers can only be cleaned by chemical means owing to their geometries, etc. Other aspects must also be taken into account when carrying out an oil change. 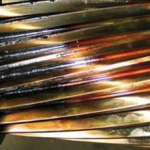 In view of the initially greater dissolving power of fresh oil, old deposits are stripped off the surfaces of components through which the oil flows, such as pipes and coolers. This process must be compensated by temporarily intensifying filtration in the partial-flow filter. 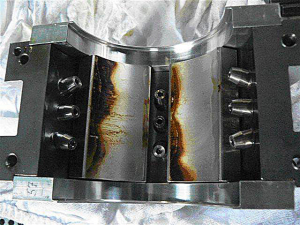 Following turbine shutdown, cooling-down of the oil in the control-oil circuit can result in additional agglomeration of oil degradation products and to an even more negative impact on the control response. Ageing products that become suspended in the oil can no longer be filtered by conventional means owing to their size (in most cases smaller than 1 µm). Turbine oils that are advanced in terms of their greater performance and lower concentration of substances detrimental to health are more refined than previous oils. Owing to the reduced concentration of unsaturated, polar hydrocarbons, only smaller quantities of the likewise polar ageing products can be borne in solution by the oil itself. For this reason, when changing the oil, it is essential that all residual used oil is thoroughly drained and, if necessary, flushed out of the system with flushing oil to ensure that the ageing products left behind from the previous oil charge do not find their way into the fresh charge. The Remaining Useful Life Evaluation Routine (RULER) test is used to measure the concentration of the antioxidants still in the oil. If the reading is low, the degree of protection against deterioration (ageing) is restricted. At the same time, we must nevertheless assume that the oil contains deposits resulting from the degraded antioxidants. The propensity for an oil to form varnish deposits can best be analysed by means of a Membrane Patch Colorimetry (MPC) test in conjunction with particle counting. In the case of the MPC test, the intensity and colour of a laboratory filter membrane through which a defined quantity of oil has been drawn under a vacuum is measured electronically. With particle counting, one measurement is taken at room temperature and another after heating the oil. As oil reaction products are soluble at temperatures above 40–55 °C, the results differ when deposits are present. It is important that analysis intervals are adapted to the condition of the oil and the results are presented as a trend over time. The mission is to remove impurities that lead to the formation of deposits from the oil. This increases the oil’s capacity to dissolve oil reaction products, giving the oil the ability to take up deposits that have settled on surfaces inside the system. Deposits in both suspended and dissolved state are to be eliminated from the oil. The classic partial-flow filtration system is of little use here, because the particles are mostly below 1 µm in size and therefore too small. A more promising solution to this problem can be found in partial-flow processes conducted under electrostatic forces or using filters that, thanks to their polarity, are capable of absorbing degradation products. Most of the time, these technologies remove just the solid components. By supporting the process with cooling equipment, the dissolved components can be precipitated – although it should be noted that this cooling process has to be conducted over a period of several hours before oil reaction products precipitate. In addition, it is also possible to bind the oil reaction products to special resins by means of an agglomeration process. Based on extensive research, first-hand experience and countless discussions with systems providers, users, turbine and oil manufacturers, WESTO has analysed and assessed the methods available. What has become very clear is that the technique of binding components to resins is effective at eliminating both suspended and dissolved oil reaction products and doing so while the oil is at operating temperature, that is, during operation. In order to meet the demands for successful and rapid removal of varnish-forming impurities, WESTO has decided in favour of the Electrophysical Separation Process (ESP), using specially adapted resin compounds from FLUITEC. This technology is now available from WESTO.